Asthma exacerbations can impede a child’s ability to learn, play and exercise. As the most common chronic illness of childhood, asthma is responsible for millions of school absences per year. Asthma also disproportionately affects children who grow up in poverty and is one of the leading causes of pediatric hospitalizations and ER visits in the Greater New Orleans area. In an effort to reduce the number of asthma exacerbations requiring hospitalization and improve asthma control, the New Orleans Children’s Health Project has partnered with two local school districts (ReNEW in Orleans Parish and Jefferson Parish schools) to provide asthma management and education. 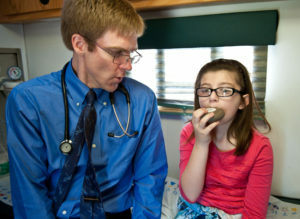 Our staff and resident physicians visit these schools weekly to assess students with asthma. Direct clinical care is provided on-site at the school-based health centers to many children who have numerous barriers that prevent them from visiting their pediatrician. The team also provides comprehensive asthma education as a continuation of the Tulane-Ochsner pediatric residency program’s 2015-2016 second year class advocacy project that developed a sustainable asthma education program in these schools. To improve the health of underserved children, families, and communities in the Greater New Orleans area by providing guaranteed access to pediatric primary care and through innovative approaches to prevention, advocacy, education, and research. Formed in the aftermath of Hurricane Katrina, the New Orleans Children’s Health Project evolved into a long-term investment in the future of New Orleans by bringing high-quality compassionate care directly to the city’s youngest and most vulnerable residents.